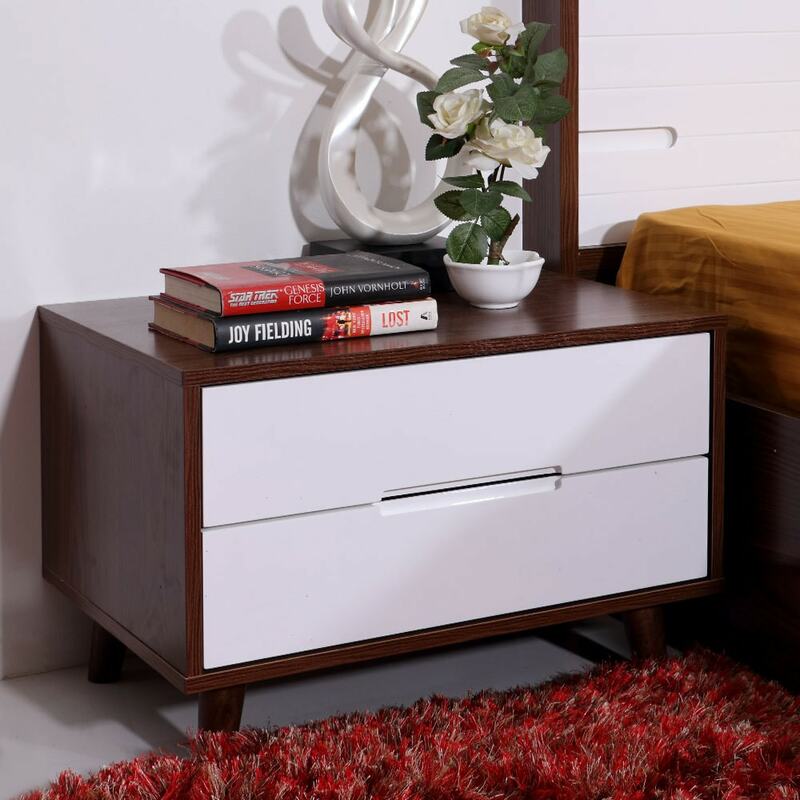 Made Up Of Thick 25Mm Mdf Wood With White & Walnut Finish.Horizontal Grove Design Runs On Entire Bedroom Collection Which Gives Elegant & Modern Look. Night Stand, Dresser & Cod With Wooden Legs & Easy To Clean Underneath Designfull Door Size Mirror Provided On Two Centre Doors Of Wardrode . A modern take on the night stand, the Lukas Engineerwood will add the perfect minimal vibe to your bedroom. Carefully constructed from 25 mm thick MDF wood, the piece features both natural, woody tones as well as a beautifully contrasting frosty white chest of drawers. Although this piece may be purchased individually, it is part of a larger collection, all of which consistently feature a horizontal grove design element. This night stand is the perfect height at 16 inches, and can be used to place both decorative items, or reading material. Thoughtfully elevated a few inches above the ground, this night stand makes it easy to spruce up your room. Short but slim wooden legs anchor this piece, while a metal frame inside the drawers make it easy to slide them open at any time. You can choose to buy this piece from our online furniture site, or visit any of our 25 furniture stores across India for the best deals in home furniture. Panel board Furniture made out of MDF, Particle Board or Ply wood. What is MDF: MDF (Medium Density Fibre board) is an engineered wood product composed of fine wood fibres (Pulp) combined with a synthetic resin or other bonding system & joined together under heat & pressure to form panels. Itâ€™s less dense as compared to HDF(High Density Fibre board). Particle board or Chip board is a board made from graded wood chips / saw dust / wood particles bonded together with an adhesive under great pressure & heat. The constituents are similar to MDF but with a low density.